Trec Dextrose Powder is a unique supplement containing only pure dextrose. It works great as an immediate replenishment of glycogen stores after training as well as an intra-workout product during prolonged or very high intensity exertion. The product is produced in the form of a powder, which dissolves perfectly and allows easy measuring of portions. Dextrose is a glucose isomer, a simple sugar, which is in the monosaccharide group. Large amounts of this compound occur naturally mainly in fruit, honey or nectar. Due to its simple structure, the glycemic index (IG) of dextrose is 100, which means that it immediately raises the level of sugar in the blood. It does not require high enzymatic activity, which does not burden the digestive tract. During training, skeletal muscles use glucose for work. They usually take it from the peripheral blood, which is reached as a result of eating carbohydrate meals or, more rarely, from alternative energy pathways, for example gluconeogenesis. It is worth noting, however, that obtaining glucose from other nutrients than carbohydrates is highly ineffective and occurs to a marginal extent. In order for the muscles to be able to work continuously at a high intensity, an energy flow from food is necessary, preferably in an easily digestible form, so as not to upset the digestive system. Thanks to the high glycemic index, dextrose works great as a rapid boost of the energy that allows you to generate maximum power from your muscles. An important issue is the high nutritious density of dextrose - you can make a perfect intra-workout mix from it, useful especially during training of above average intensity or endurance character, which will additionally be extremely small in size. This allows you to consume a high dose of calories in an instant way, without upseting the stomach. The body system contains stores of polysaccharides, capable of counteracting harmful decreases in the level of glucose in the blood. The main glucose storage in the body is glycogen, a polysaccharide built of many glucose residues. The moment blood glucose level falls below physiological standards, the body extracts glucose from the polysaccharide stored in the liver and skeletal muscles with the help of a hormone called glucagon. Appropriate glycogen resources not only allow for longer strength and endurance training - they are also desirable in bodybuilding, where the muscular size counts. This fullness of muscles is achieved by the high content of backup fuel, which is glycogen. Therefore, regardless of the sport type, it is necessary to ensure quick replenishment of this polysaccharide stock. However, the fastest way to recover lost glycogen resources is to consume a high dose of fast acting carbohydrates, which undoubtedly is dextrose. Using this supplement, the athletes can be sure that their bodies immediately regain their backup fuel, which results in both better visual appearance of muscle tissue and faster return to maximum efficiency. Taking dextrose directly after training is also a great way to prevent hypoglycaemia, which is an uncontrolled drop in blood glucose. If the athlete delivers too little energy before and during the training, the muscles can use a great amount of sugar from the peripheral blood and from the storage - glycogen - leading to a decrease in peripheral blood glucose levels. Symptoms of the hypoglycaemic state are very unpleasant, including the feeling of cold sweat or nervousness or anxiety. At this time, catabolic reactions which break down the substance are also intensified, in this case it happens to increase the level of glucose in the blood. Applying dextrose immediately after the training guarantees an increase in the level of sugar in the body, making it impossible to go below physiological levels. Therefore, it is worth using dextrose during the so-called anabolic window (after the strength training), so that the body would always have the right amount of energy substrates, especially during the period of building muscle mass or strength. 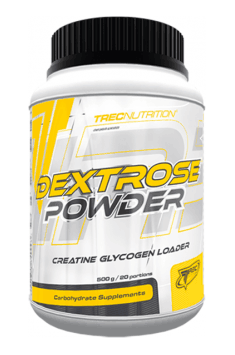 In conclusion, Trec Dextrose Powder is a universal supplement for use before, during or after the training to provide the energy. It immediately replenishes the glycogen stores, which allows you to raise your training to the next level and improve your well-being immediately after the workout. Dissolve a single dose of the preparation – 25 g (2 tablespoons) in 300 ml of water. Depending on the needs, use 1-2 portions a day, preferably in the morning after waking up and immediately after training. On non-training day you may skip taking the preparation. This supplement is intended especially for people who use endurance training, with a large volume or very high intensity. During training or competing in circuit sports, it is worth considering preparing a higher dose than the standard one, while maintaining the same volume of water. While using the preparation as part of the intra-workout supplementation, it is worth enriching the shake with the dose of amino acids, caffeine and minerals. Raises body’s exercise capacity, increases motivation, supports body fat reduction.